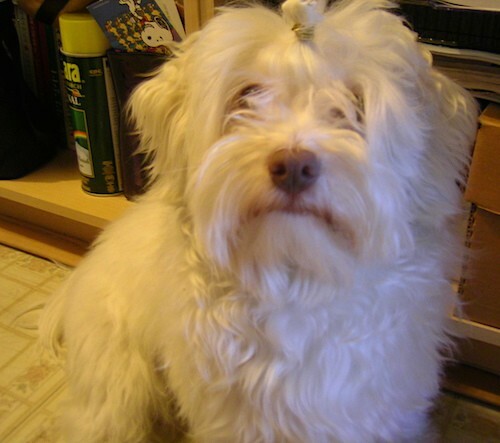 "My dog, Buddy is a Bolognese / Maltese mix at 6 years old. He loves to play and gets along with dogs that are dominant over him. He loves to chase small, bright moving objects and he pounces like a cat. He is very intelligent and knows all sorts of tricks. He has the best qualities of both breeds except for the excessive high pitched barking. I got him from a previous owner that moved into an animal free zone. Strangely after my dog stayed at my aunt's house (who had another dog) for a week he changed his bark from a 'woof' to a 'cooo'. I take him out five times a day for 10 minutes each. He loves to pose for the camera." 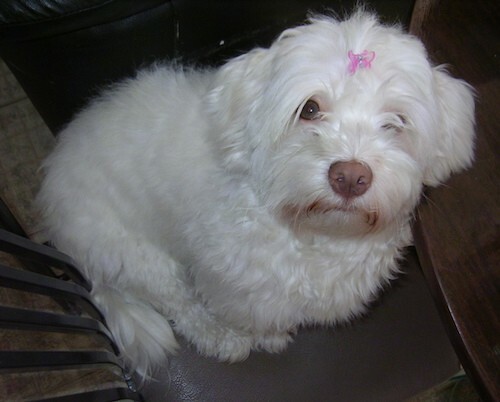 Buddy the Bolognese / Maltese mix at 6 years old.